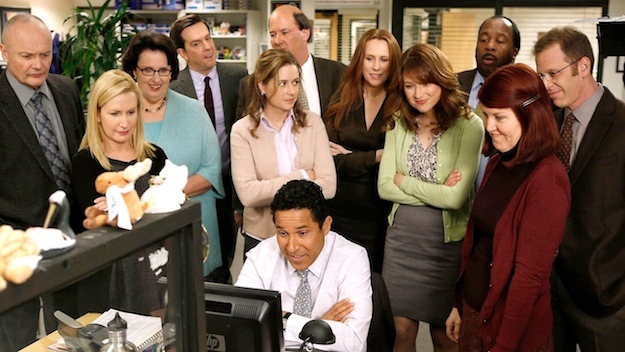 The “ordinary people” at Dunder-Mifflin shared cubicles, and tasks, and projects, and meetings in the conference room, and office parties; but other than that, they went home to their own lives. But, over the course of many years, and trials, and triumphs, these diverse people with nothing in common became friends, and then they became a family. And as I reflected on the routine existence of this group of people, I was reminded of just how often I look for the “spectacular” things in my own routine life; secretly hoping for something great to happen to lift me out of my boredom, that I miss the beauty of ordinary things, and people, right in front of me. Stanley had his pretzel day once a year. Dwight got excited about being safety officer. Michael loved the office parties and the conference room meetings, and for all his quirkiness, he knew how to successfully lead that office. Jim always wanted to leave and go on to greater things; but, in the end he found what he always wanted and needed in that tiny office. Everyone had a role both in the company, and in each other’s lives. In the end, many of us came to enjoy The Office because it allowed us to witness all facets of the human experience within the confines of a mundane office setting. The best of life and the worst of life were on full display. The Office didn’t need an epic, world-changing story arc to satisfy the viewer. As Pam reminds us in the quote above, there is true beauty in ordinary things, and that is what kept us coming back for nine seasons. As followers of Christ, we sometimes refuse to acknowledge the reality that God’s Spirit works in the seemingly mundane moments of life. We may hear that an “ordinary” Christian life isn’t good enough, and while that’s not always bad advice, I think the more that we feed on a “what we’re doing is not good enough” diet, the more we start to believe that God doesn’t work in and through the “stupid, wonderful, boring” things in our lives. The gospel challenges us to live in such a way that is anything but ordinary to the world around us. For nearly all of us, opportunities to experience and proclaim Jesus will arise in the moments and situations we perceive to be dull or unimportant. Those opportunities might include hosting a baby shower for an expectant mother, or talking with strangers at the Greek Festival, or going with a neighbor to Friday Cheers, or visiting a nursing home even when you don’t know any of the residents, or coordinating a progressive dinner with your neighbors. They might involve expressing doubts in the comfort of your community group, or serving in RH Kids on Sunday mornings. These moments may not warrant a facebook or blog post, but they allow for divine encounters with Jesus, and opportunities to share his good news, in the times when we least expect it. Our God is writing a grand story. Tucked into that story are many, many, many, many a lot of moments that often appear mundane, ordinary, or just plain uneventful; and yet, those are the ordinary moments that point to the extraordinary hope that we who call ourselves Christians have found in the resurrected Son of God, Jesus Christ.